The Missouri Boys State Memorial Trust is a very important part in securing the future of the American Legion Boys State of Missouri program. It is essential that the Trust flourish in order to ensure a successful program now and in the future. The Trustees believe that in order to maintain the highest quality program, staff, and participants, and to continue the unfettered teaching of our democratic form of government and the vitality of the free enterprise system, it is imperative that an independent source of funding for Missouri Boys State be assured by its administrators. The Board of Trustees of the Missouri Boys State Trust and the Board of Directors of Missouri Boys State are committed to this goal. The Missouri Boys State Memorial Trust was established on January 9, 1982 with the primary purpose of providing a strong financial base for The American Legion Boys State of Missouri. Charlie Bacon, the first chairman of the board of trustees and former national commander of The American Legion, described the Trust as a “rainy day fund” created to ensure that Missouri Boys State would never fail for financial reasons. Concerned that The American Legion may not be able to provide for the program’s financial stability in the long-term, Commander Bacon and the original board of trustees sought to have the funds that would ensure that Missouri Boys State would exist in perpetuity. The Trust has continued to focus on building the strong financial base needed to reach the goal of financial independence that Commander Bacon envisioned so long ago. While the focus of the Trust is still the long-term financial health of Missouri Boys State, the Trust also provides for a select few immediate needs to benefit the program as opportunities are identified that will significantly improve the Boys State program. The general corpus of the trust is meant to ensure the financial stability of the program in the event that the American Legion can no longer provide sufficient support. However, in order for Missouri Boys State to derive some immediate benefit from the Trust, there are restricted funds earmarked for important programs. The George W. Lehr Memorial Speakers Chair - George Lehr was Auditor of the State of Missouri and a former Boys Stater. Upon his death, the George W. Lehr Memorial Speakers Chair was established by Mrs. Barbara Lehr. Funds cover the fees and expenses for a “keynote” speaker of national notoriety at each session of Missouri Boys State. The Wayne S. Gregory College Scholarship Fund - This scholarship is awarded annually to the student selected “Citizen of the Week” at the program. The scholarship was endowed by the Springfield Kickapoo Voiture 40/8 in memory of Wayne S. Gregory a former 40/8 member and Boys State Commission Chairman. The selection is based on scholarship, citizenship and leadership. 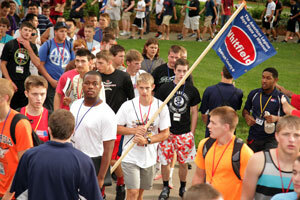 The Trust also funds a scholarship for a member(s) of the volunteer staff who serve the Boys State program each year. 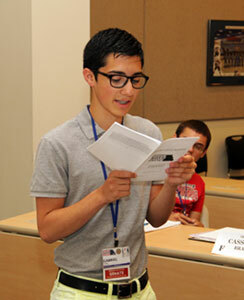 The Dean of Counselors awards this scholarship based on leadership skills and service to Boys State. The Directors’ Sponsorship Fund – Established in 1999, this restricted fund is reserved solely for covering the cost of sponsorships where The American Legion participation has diminished. The trustees are committed to making the Missouri Boys State experience available to all qualified students regardless of their high school size or location. This fund also provides for sponsorship of participants in the inner city school districts in Kansas City and St. Louis where sponsorships may not be available. The A.B. Weyer Memorial Fund – All unrestricted funds not designated to a specific Trust initiative reside in the A.B. Weyer Memorial Fund. A.B. Weyer was co-founder of The American Legion Boys State of Missouri and the first Boys State Quartermaster in 1938. The Trust depends solely on corporate, civic and individual donations and gifts. The Missouri Boys State Memorial Trust is certified as a 501(c)(3) not-for-profit educational youth program under the Internal Revenue Code through it’s relationship with the Greater Kansas City Community Foundation. Since no goods or services are rendered in return for a donation to the Trust, contributions are fully tax deductible. * The Trust receives no government support and receives no support from the United Way. * Check with your tax consultant for more information.